Download the report as a PDF or order a hard copy of the report and other free materials from War on Want. See Palestine Solidarity Campaign’s resources and shop, or order free materials from War on Want. Book a speaker or workshop from War on Want: Email takeaction@waronwant.org for speakers and workshops on the Stop Arming Israel campaign, corporate complicity in the Occupation, the role of the UK government, the global movement for boycott, divestment and sanctions on Israel. 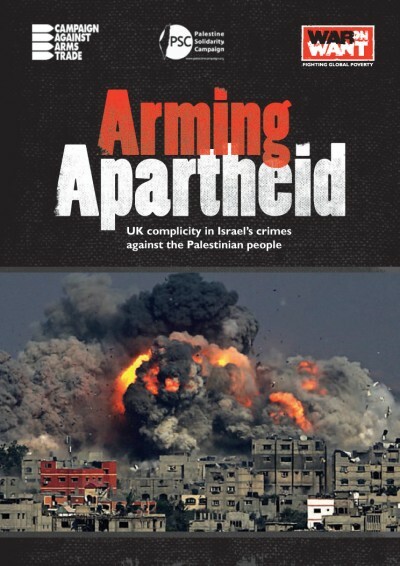 Book a speaker or workshop from CAAT: email outreach@caat.org.uk to request workshops or speakers on arms sales, action to Stop Arming Israel from lobbying to direct action, or to plan your resistance to the DSEI arms fair in London this September. Book a speaker from Palestine Solidarity Campaign: by emailing info@palestinecampaign.org. PSC can organise speakers on Palestinian rights that will focus on what you and your group can do to help Palestinian people achieve a just peace. UK arms export licences to Israel: Search exports of arms and other controlled goods approved by the UK government. Mapping Israel’s suppliers: 100 companies supplying military and security equipment to Israel have bases in the UK. Find out about the suppliers on your doorstep, or download our infographic.